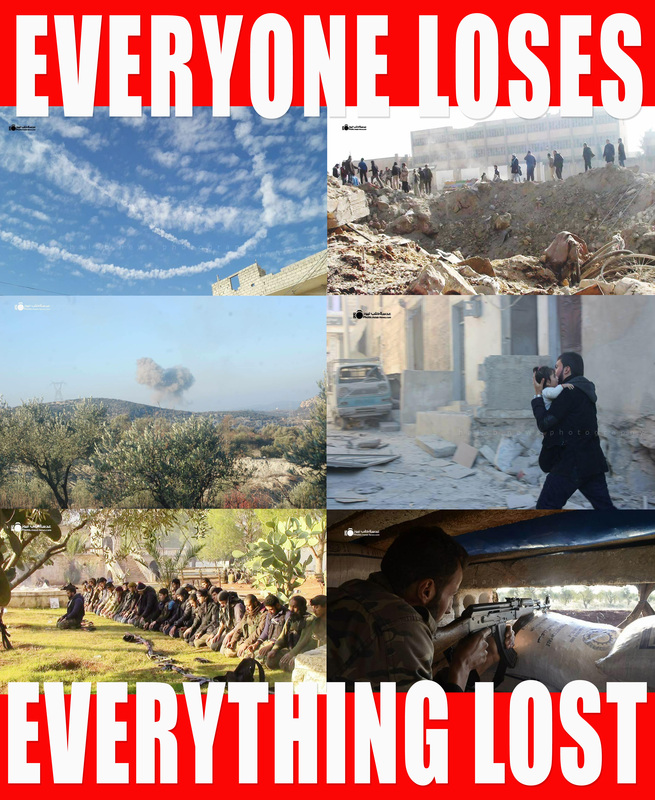 … nothing is gained be it with hand weapons on the ground or with planes bombing from the air – territory won yesterday is lost tomorrow – communities are destroyed – great powers are powerless – local powers are reckless – those who have fled will be hated for it by those who stayed behind… later. Does it still matter what the captions of these photographs are? The role of perpetrator and victim are dynamically reversed in civil wars even more so with this war that has become at the same time a ‘proxy war’ between world powers and their shifting local alliances. 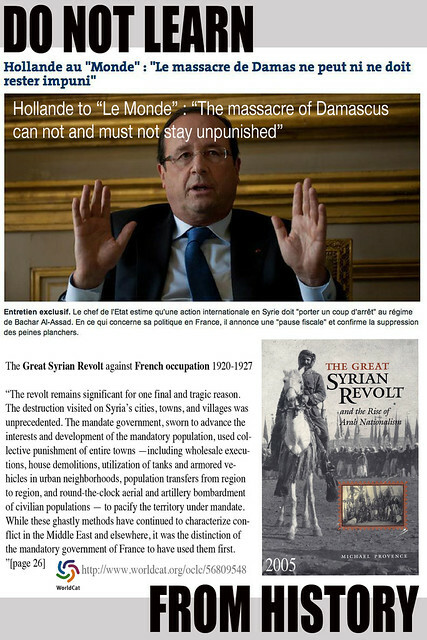 One century after the (secret) carve up of the Ottoman Empire, including (nowadays) Syria, Iraq, Lebanon, Jordan, Israel/Palestine, in the Sykes-Picot Agreement worked out by the colonial powers of France and Britain with the assistance of Tsarist Russia (also a colonial power be it continental eastward)… one century later this dirty colonial deal still casts it’s shadow over the region. Instead of a ‘common wealth’ of the Levant, there is ‘common misery’ produced by all those who still try to grab territory and power for themselves, with the exclusion of those classified as ‘others’. As always religious, ethnic and ideological differences are wrenched into levellers of dominion. Sunni, Shia, Christian, Jews. Kurds, Druze, Armenians, Israeli, Palestinians. Zionism, salafism, jihadism, wahhabism, name it… false ‘common causes’ that by their idea of ‘primacy’ of one particular cause over others, neglect the rights of all those human beings that do not fit the ideological or religious labels that are imposed. Both Britain and France have been bombing what they saw as insurgents against their power in the twenties and thirties of last century. (1) The Brits called it ‘policing from the air’ and now they do the same with a new type of insurgents that has been bred in the cauldron of geo-politics – the Middle East – and spreads far beyond: ISIS. No democracy will be brought about by bombs, thrown by hand or from the air. Destroying the bases of ISIS means at the same time destroying all of the territory where they reign. Not just ISIS offices, barracks, weapon depots, vehicles, fuel, but also the amenities of those terrorised by ISIS. Will people embrace these “forces of liberation” that killed (collateral or not) and destroyed their neighbourhoods? The same goes for areas under control of whatever temporary warlords, many spending more energy on in-fighting than opposing the official Syrian regime. If air power could do anything, than it should be under joint United Nations command, imposing a full fledged no-flying zone and employing at the same time an international UN ground force. No more strafing bombing missions, neither by USA, NATO, Russia, Turkey (in their no-NATO role), Assad forces, and so on.